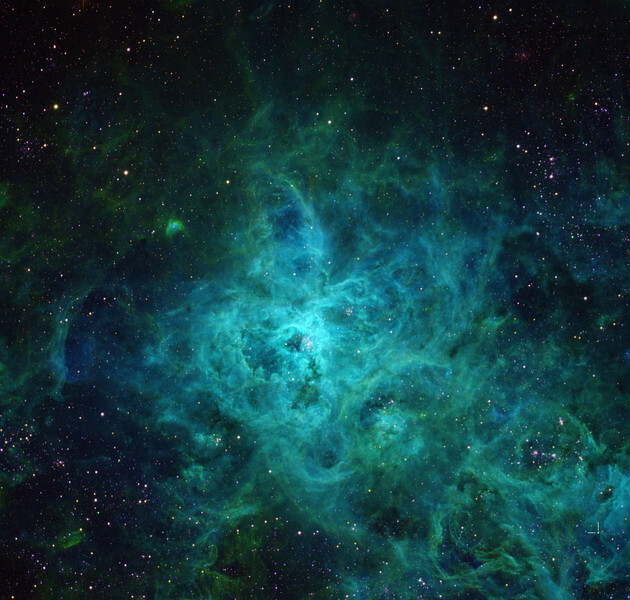 Tarantula in Greater Magellanic Cloud. Red: 2hrs [SII]. Green: 2hrs H-alpha plus 2hrs [NII]. Blue: 2hrs [OIII]. North up. The site of SN 1987a (unresolved) is marked at bottom right. In H-alpha it is a tiny green smudge. In [SII] it is two stellar dots. Aspen 16M on 20" PlaneWave CDK on MI-760 fork.